PAX, Pancakes and Pancake Bob, Oh My! The world's most famous least interesting Sim, Pancake Bob, will be in Seattle this weekend. 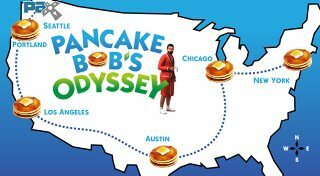 He has been travelling the United States in search of the fluffiest stack of pancakes the world has ever known. You may have spotted him and his trademark red robe, in New York, Chicago, Austin, Los Angeles and Portland. Now, his cross country quest in search of pancake perfection has brought him to the home of the Penny Arcade Expo (PAX). For two days, Pancake Bob (and some of his Sim friends) will be treating fans to a FREE PANCAKE BREAKFAST*. All he asks is that you share a photo of yourself with the pancake legend on Twitter, Facebook and/or Instagram. Still hungry for more The Sims 4 awesomeness after breakfast? Head over to PAX and check out our photo booth. Not only will you get a great shot with your friends to share and print but you’ll also receive special gift from The Sims 4 team. We’ll be at booth S4 in the South Lobby for all four days of PAX, and we’re looking forward to seeing your smiling faces! Can’t wait to see The Sims 4 gameplay in action? Stop by the Twitch booth or tune in to twitch.tv/PAX on Saturday, August 30 at 4:00-4:30pm PDT to watch a live demonstration Live Mode! Don’t miss this chance– you never know what unexpected things might happen in The Sims 4. Of course, you can follow all the excitement on Pancake Bob’s official Twitter and Instagram, and feel free to show him some love with #TheSims4 and #pancakebob while you’re there! *Limit one order of pancakes and one cup of coffee per attendee, while supplies last.